I’ve been promising to share my focaccia bread stuffing recipe for years. But, I’ve been dragging my feet like a typical Neanderthal. Guess what? The wait is over! This stuffing is so good, we make it several other times during the year. Of course, it’s perfect for Turkey Day. So, the timing couldn’t be better. If you’d like, add sausage, bacon, mushrooms, leeks, dried fruit, apples, grapes, or just about anything to snazz it up. Though, the Caveclan likes to just go with this basic combination. By the way, this recipe can be used inside the bird or out. If you want both, you’ll have to double it. Slice focaccia loaf into small bite-sized pieces. Place onto cookie sheet and put into a preheated 350° oven for 10-15 minutes until cubes become croutons and are very lightly browned. NOTE: You can make your own homemade bread. Though, the bakery at our local market makes an incredible “Italian Flatbread” that is absolutely perfect. 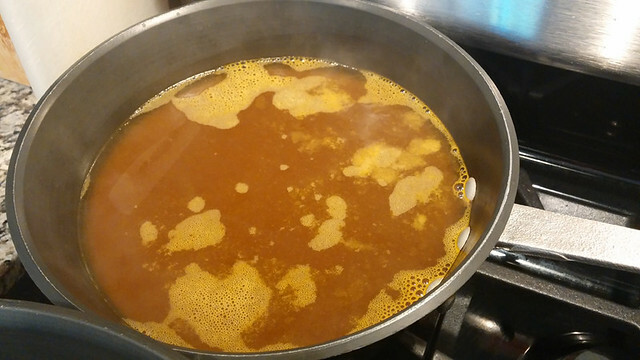 Place broth into a medium sized pot and heat until warmed. Do not bring to a boil. Dice celery, water chestnuts, and onion. In a large stock pot, heat olive oil. Add diced veggies and saute until onions become translucent. Turn off flame and add focaccia croutons. Gently stir until bread cubes are covered in olive oil. Then, 1/2 cup at a time, slowly add warm broth and stir together so that croutons become evenly coated. Once stuffing is sufficiently soaked (you don’t want mush, but your don’t want them too dry, either) you are ready to move on. 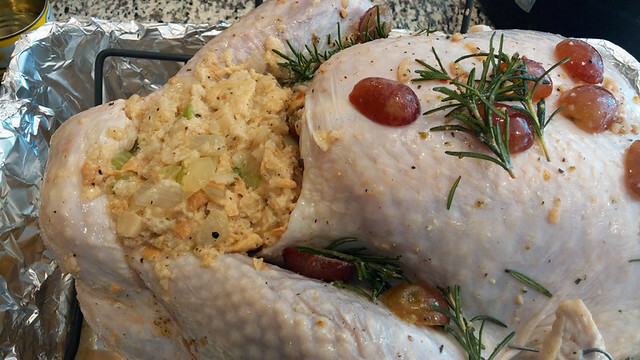 If you are going to cook your stuffing inside the turkey, loosely spoon it into the body and neck cavities of the turkey just before you start roasting. 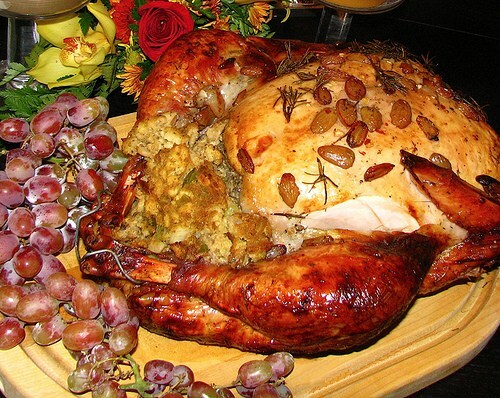 Be sure to cover both the bird and stuffing with a foil tent until the last hour of cooking. Stuffing is done when the center of it reaches 165°. The outside will have a nice brown crust, while the inside will be moist and flavorful. 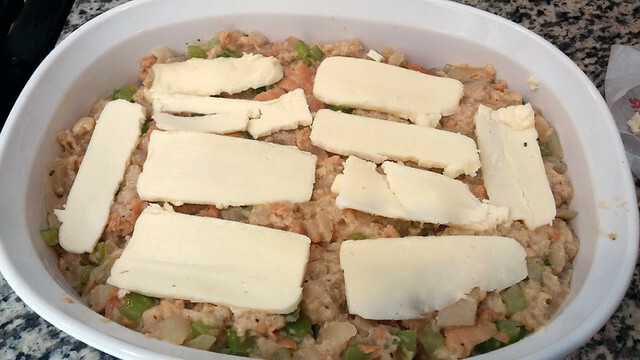 Spoon out all the stuffing into a serving bowl, cover, and let stand for about 7-10 minutes. To make your stuffing outside of the bird, butter the inside of a large baking dish. Spoon in stuffing, and top with thin slices of butter. Cover the baking dish and place into a preheated 375° oven. After 25 minutes of baking, remove the cover and allow the top of the stuffing to brown for about 20 minutes. When done, remove from oven, cover, and let stand for about 7-10 minutes. Now, serve your stuffing along side all your other Thanksgiving goodies, and enjoy! Cooking Time = 45-50 minutes outside of bird. When turkey is done and stuffing reaches 165° inside of bird. ©2016 Caution: Caveman Cooking/UHearMe, Inc. All rights reserved. This recipe originally appeared on the Caution: Caveman Cooking blog at http://cavemancooking.net authored by Caveman. This recipe may be shared and reprinted as long as this entire copyright message accompanies it.